Shibui is probably the most difficult thing to achieve, mainly because you're never satisfied. It's the ability to get more out of less. In art, it's expressing something more profound in a simpler way. The Japanese are great admirers of Shibui. It's something I've grown to appreciate as Sash and I continue on with Road Pickle. Take our computer bag, for example. 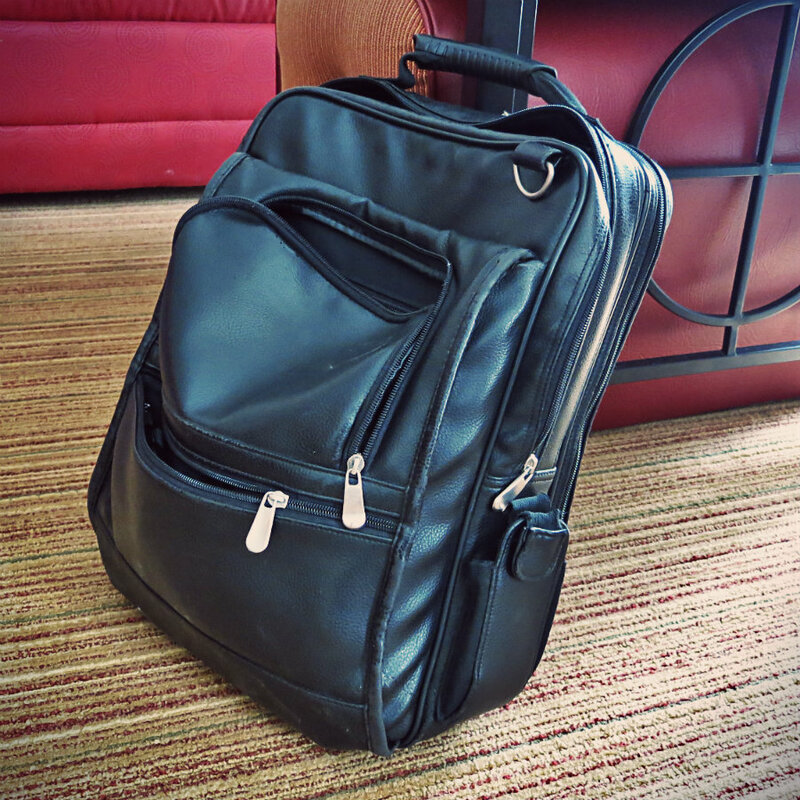 Sash and I store all of our computer gear in this black leather bag, which is actually a backpack. It stores our two laptops, our tablet, our external drives, all of our power cables, USB cables, HDMI cables, camera chargers, mini speakers, and bunches of SD cards. In a way, I appreciate how we're able to store all of that into one bag that fits nicely into the trunk of my Honda ST. However, I'm dissatisfied because the bag becomes overstuffed and bloated. It's like we haven't really simplified, we've only concealed the excess. So, last week we got rid of our two laptops and replaced them with two Surface Pro 3's. These are actually 12" tablets that come with very thin, light keyboards. The two take up the same room as one of our laptops. Sash detaches the keyboard and lays on the couch or bed of our hotel room and continues working. She's able to get more things done without having to remain seated at a table. And that accomplishes the "Shibui" I'm looking for. We've reduced the weight and volume of our computer bag, while actually increasing productivity. So now, I'm looking at buying a Chromecast. That's the little device that plugs into the HDMI port of a television. It allows you to stream video from a laptop, tablet, or phone to your TV via Wi-Fi. The Chromecast is much smaller than the 6 foot HDMI cable we currently use to stream video to a TV, but because it's wireless, we don't have to walk to the laptop or tablet to play a different video. We've actually looked at everything we own and come up with ways to achieve Shibui. We found exercise clothes that look appropriate enough as bathing suits. We can use the same set of duds to work out in and relax in the hot tub afterwards, thereby lightening the load on our suitcase. We moved all of our medications and vitamins into Ziploc bags because you can squeeze the air out of them and really shrink their size, whereas plastic pill bottles take up way more room. Ziploc bags make great travel containers because they fold up so small, allowing you to keep several extras on hand. But Shibui is not something that has translated over to motorcycling much. I mean, my Honda ST1300 does a good job of offering storage, with good power, handling, and great range. But motorcycles have become bigger and heavier than compared to 50 years ago. I want to see a motorcycle that offers more storage, more power, and more amenities in a simpler, lighter, and more efficient design. The end result of pursuing Shibui, I believe, has caused me to examine things on the standpoint of increasing value while decreasing load. It makes me question what I need, don't need, and what can be multipurposed. The full time riders I've met in person, like Kevin Bean're and Vespa Steph, all have their ways of achieving Shibui. A new term for me but not a new concept. Shibui, thank you for three word. The problem with the Chromecast is that needs Wi-Fi to work and most hotels make it such a hassle to connect. I used to carry around my own access point but that's just one more thing to haul around. I'm not sure what the solution is but I ended up selling the Chromecast shortly after getting it. Too much hassle. I've been reading Chromecast reviews, and you're right about connecting to hotel Wi-Fi. So, am now looking at the MK808B as an alternative. Does that mean you're considering a new bike? I wonder if the BMW F800GT would fit the bill. It puts out about 100 hp, which is 17 less than your Honda but still admirable. Gets up to 60 mpg, is relatively light, and is available with more bells and whistles than you can imagine. Storage-wise, though, I'm not necessarily sure it would compete. You make a good point because the technology exists to make quality machines that don't weigh so damned much. But it's the nature of consumers that they don't always want the best thing as much as they want the biggest or coolest thing. I suppose I can loop myself into that criticism at times. On a side note, I'll be interested to hear how y'all get on with the Surface Pro 3. I'm considering getting one for Jenn. I've been seeing the Surface Pros advertised and thought they looked good. More functional than an iPad for sure. Glad you cold lighten the load a little. All I've used is Macs for 13 years, both at work and at home, so I am no help in the Chromecast dept. Shibui...never hear the term, but I do appreciate the concept. Minimizing is essentail if one is to spend any extended time road-tripping on a bike. I also have an ST, an '08. A great bike but the lean over riding position is a bit hard on my wonky back...despite six inch risers on my handlebars. My retirement bike is going to be a GTL 1600 BMW. I think we'd all be better off if we practiced a little more Shibui. It would help us better discern what is really important and why. As Americans we've come to think that bigger is better and if a little is good, more is great. We need to simplify. Thanks for making me think about that and introducing a new word to my vocabulary. I hope you and Tina can continue to simplify your lives and can continue to have safe travels. I enjoy reading about your adventures and insights.